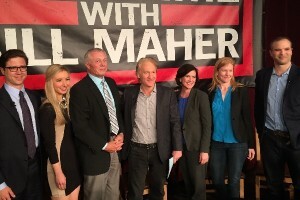 HBO’s Real Time with Bill Maher recently taped its Flipadistrict segment in Northfield, Minnesota. Maher has named MN02 District 2′s Congressman John Kline the nation’s worst legislator and is attempting to flip him out. I wrote about this earlier if you’re looking for local news reaction. Six panelists debated the environment, student debt, and women’s issues. From left to right, panelists included John Rouleau, ED of the Minnesota Jobs Coalition. ; Katie Keiffer, author of “Let Me Be Clear: Barack Obama’s War on Millennials”; U of M professor Steve Sviggum; Maher, Minneapolis mayor Betsy Hodges; Ana Marie Cox, The Guardian and The Daily Beast; and Matt Taibbi, author of “The Divide: American Injustice in the Age of the Wealth Gap”. Kline is, for instance, virulently anti-immigrant, but lives in one of the handful of Republican districts where polling indicates that constituents are not just pro-immigration reform but who say they would vote against the incumbent for not supporting immigration reform. Kline’s support of the bogus for-profit college system (a quarter of all his campaign donations come from that sector) and his opposition to student debt forgiveness are at odds with the needs of the thousands of college students (from St. Olaf and Carleton College) who live in MN-2. Those mismatches, plus the disproportionate amount of campaign funds Kline receives from outside the state, are reasons that Maher chose Kline—and the reason that Maher could have chosen dozens of others. Off to Northfield. 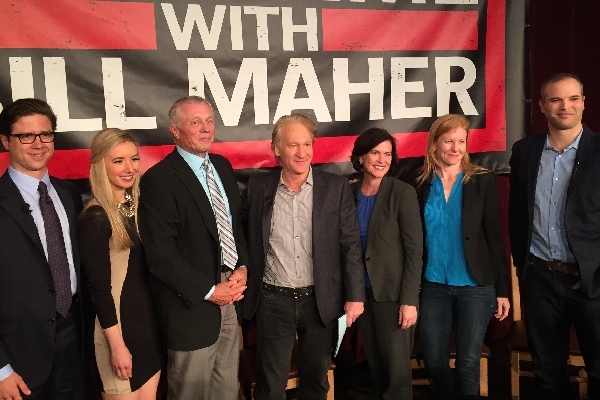 Looking forward to participating in tonight's panel w/ @billmaher, @MayorHodges, @anamariecox, @mtaibbi & @KatieLKieffer. He sure did buddy up to Maher. Arms around Maher, smile in his face. But nothing yet written written after the panel. Nothing yet written after the panel.